December 30, 2013 - Reno Air Racing Association (RARA) reported on Monday that they have let Mike Houghton, RARA president & CEO go. Houghton’s departure was due in part to a restructuring of the organization and the fact that RARA operating cost have risen by nearly $3 million in the last two years. The increase in insurance cost came primarily due to a crash On September 16, 2011 in which a modified P-51D Mustang named "The Galloping Ghost," piloted by Jimmy Leeward, crashed near the stands during the Gold Heat of the race, killing Leeward and 10 spectators and injuring 69. Race organizers cancelled all remaining 2011 races after the accident. After tightening its safety rules, the Reno Air Races resumed in 2012. In wake of this tragedy and skyrocketing costs the RARA revised its organizational bylaws and restructured its board of directors in an effort to allow for an effective decision-making organization. The RARA will focus on sponsorships, coalition building and fundraising. The RARA’s board of directors will fulfill the CEO roles and responsibilities. Mike Major, Chairman of RARA's Board of Directors said “Collectively, we would like to express our gratitude to Mike for his leadership and professionalism over the last 15 years. Mike has helped to guide this organization through some very significant challenges and some great successes. This is an extremely difficult decision but, in light of current circumstances and financial restraints, we felt that it was in the best interest of the Air Races to further reduce expenditures and streamline our efforts toward long-term viability. “Operating costs alone have risen by nearly $3 million in the last two years, driven primarily by insurance, but this situation has forced us to really step back and take a look at how this event is run, redirecting and streamlining our efforts to increase sponsorships and create a more dynamic fan experience.” Major went on to say “Our foremost priority as a board is to keep the Reno Air Races tradition alive for another 50 years. 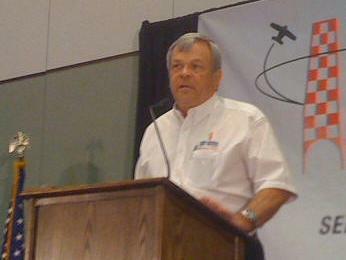 Mike has been a friend and mentor to those of us in the air race family for many years. We appreciate the dedication Mike has given the organization and the community and wish him the very best of luck going forward."